Shop and vote in Chips for Change by October 26 and help raise funds for our Behaviour Rehabilitation Program! Head along to Barkly Square shopping centre in Brunswick, Melbourne and be a part of a new community initiative that puts the chips in your hand. By simply shopping and spending the minimum amount at participating retailers, not only will you get to vote for The Lost Dogs’ Home as your favourite charity, but also be in the draw to win some fantastic prizes! What is Chips for Change? Set to take place three times a year, Chips for Change gives shoppers their vote on three community organisations or charities selected by local residents, the Moreland council and Barkley Square. Essentially, Chips for Change helps you, help your community. So, if you live in the area cast your vote and don’t forget the other candidates including Clifton Hill Primary School and Brunswick Tool Library! 1. Head along to Barkley Square shopping centre before October 26. 2. Make the minimum spend at a participating store and receive a chip. 3. Cast your vote at the Chips for Change boxes located at the fresh food precinct. 4. Chips will be tallied and the winning community group announced on October 28. 5. Winning customer announced on October 29. 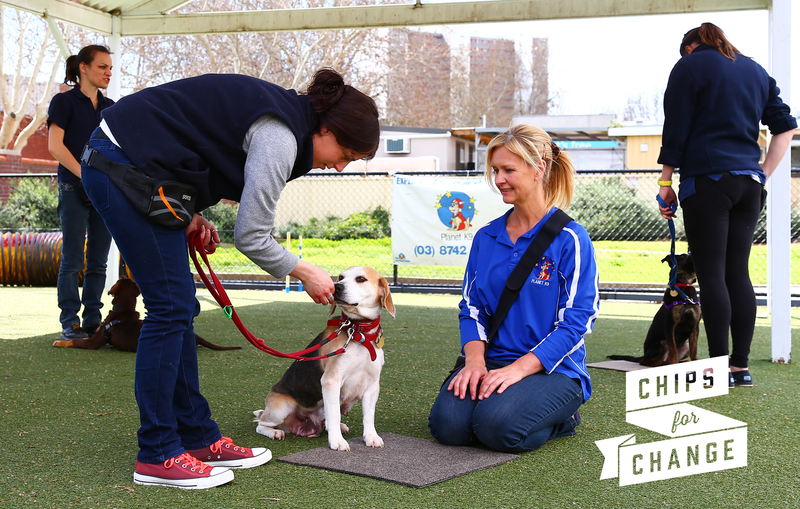 Your vote will help fund our vital Behaviour Rehabilitation Program that transforms the lives of unclaimed dogs. Many dogs require extra time to unlearn bad habits, overcome debilitating behaviours such as severe shyness, while some just require a brush up on basic manners – all of which will help them take confident steps beyond the Home. – And, plenty of much needed TLC. Vote for The Lost Dogs’ Home!